WASHINGTON — Not so tricky. More straightforward. Guessing allowed. The newly redesigned SAT college entrance exam that debuts nationally Saturday is getting good reviews from some of the students who took it early this week. The new exam focuses less on arcane vocabulary words and more on real-world learning and analysis by students. Students no longer will be penalized for guessing. And the essay has been made optional. The College Board says more than 463,000 test-takers signed up to take the new SAT in March, up slightly from a year ago. Because the exam is new, the College Board, the nonprofit organization that owns the SAT, has restricted the exam on Saturday to those applying to college or for scholarships, financial aid or other programs requiring a college test score. People who don’t fall into these categories have been rescheduled to take the May test, which will be released at a point afterward. The College Board said it took the action because of concerns about possible theft. 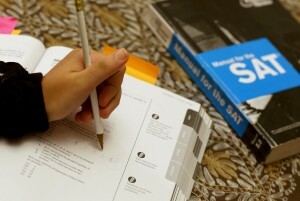 The new SAT continues to test reading, writing and math, with an emphasis on analysis. Gone: some of those obscure vocabulary words like “lachrymose” that left kids memorizing flash cards for endless hours. Test-takers will instead see more widely known words used in the classroom. Students will have to demonstrate their ability to determine meaning in different contexts. Go ahead, take a guess. Test-takers no longer will be penalized for wrong answers. In math, students will see more algebra and problem solving, instead of testing a wide range of math concepts. But use of calculators is limited to certain questions. Overall, there are fewer questions — 154 on the new test plus one for the essay, compared to 171 on the old version. Brian Keyes, a junior at Woodrow Wilson High School in the nation’s capital, says he really didn’t mind the new SAT. The exam was administered Wednesday at Wilson and other District of Columbia high schools and at schools in more than a dozen states as part of SAT School Day. This was the first revision in the SAT since 2005. The head of the College Board says students taking the new SAT will find more familiar reading passages, vocabulary words and math. With fewer questions on the new test, Coleman said, there’s more time for each of the reading and math questions. “If you’ve been preparing and putting in your study time, then you should go in confident. If you haven’t, you can take this test again or you can take the ACT, too. It’s not the end of the world if you don’t perform well,” he said. On reading, Ned Johnson, president of PrepMatters, said students should be literal, not literary. He said students could help themselves by coming up with their own answers before looking at the options provided. The College Board has teamed up with online educator Khan Academy to offer SAT practice with the new exam — for free — to all students through diagnostic quizzes and interactive practice tests. The tests are available at https://www.khanacademy.org/sat.